Terri Hill is a watercolor artist from Northern California. Her realistic watercolor paintings of fruits, still life and vegetables are so natural. She started painting in this medium in 2003. Terri have a strong background in graphic design. She started a full time painting career in 2009. Her watercolor still life paintings are noted for its saturated and vibrant colors. She paint what she loves. According to her, her living area is the perfect influence in her works. A great environment is vital for exceptional art! 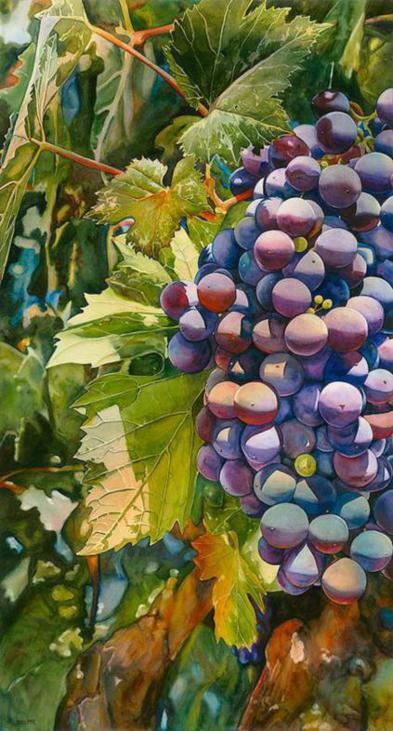 Her watercolor paintings of grapes makes herself a master artist in this domain. The way she captures shadow and glow helps to create a unique feel in her works. Her paintings are exhibited at several studios, wine and art events and galleries. She also takes watercolor demo classes and workshops for beginners. You can find her watercolor paintings in “Viewpoints Gallery”. Here are some of the selected works of this great artist. You can almost taste the fruit. Great work!